Did you know, you can see the results of meditation in your hands? The more I do my daily tune-in, the more I’ve noticed my Apollo Lines are deepening…woohoo! 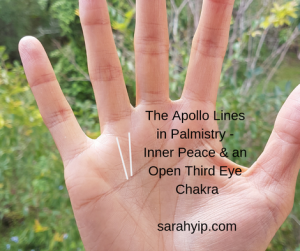 The Sun or Apollo Lines in palmistry, are vertical or curved lines running up your palms, ending below the Apollo (ring) finger. Apollo is the God of the sun, prophecy, the Arts etc. Most people have an inch or two of Apollo Line, especially above their heart line (age 50+) – see the photo for an example. This is my hand. If the Line begins below the heart line, it can be a sign of personal growth and maturity in the younger years. The presence of one or more Apollo (or Sun) Lines shows that you are capable of feeling inner peace. It also signals that your Third Eye Chakra (6th Chakra) is open and healthy. In traditional Palmistry, a Sun line indicates public success but I believe it also shows that a person is grateful for what they have, be it their love life, career and/ or spirituality. They can see the Good or God (I call God, an abbreviation of Good), in everything that happens to them. Their eyes, hearts and minds are open to love. A Sun Line enhances your ability to channel intuitive and psychic messages, as well as produce striking and original works of art, literature or music. Many performers have this Line. You could even start seeing repeating numbers like 11:11, 111, 222, 333, 444 etc. which I blog about frequently. These are signs of spiritual awakening. You’re finally seeing the order to the Universe. Please note, you have free will whatever your palms say, so there are those with Sun Lines who can seem grumpy or anti-social. There is such a thing as being ‘too’ spiritual and un-grounded. A professional palmist like myself would look at the whole hand before expressing their conclusions. Do you have a Sun Line? If not, don’t despair, you can grow and change your lines by taking up music, chanting, meditation, yoga, creative arts like painting, hiking, gardening or other pursuits which emphasise listening to your heart and being quiet inside. As your levels of optimism and creativity develop, so will your Sun Line/s. You will release your fear of your dark or Shadow side and become the Lightworker you were born to be. Note: this blog was first posted 8 Oct 2011, but was updated in 2019. Palmistry Courses in Brisbane – learn to do a basic handreading in a day using my template approach.